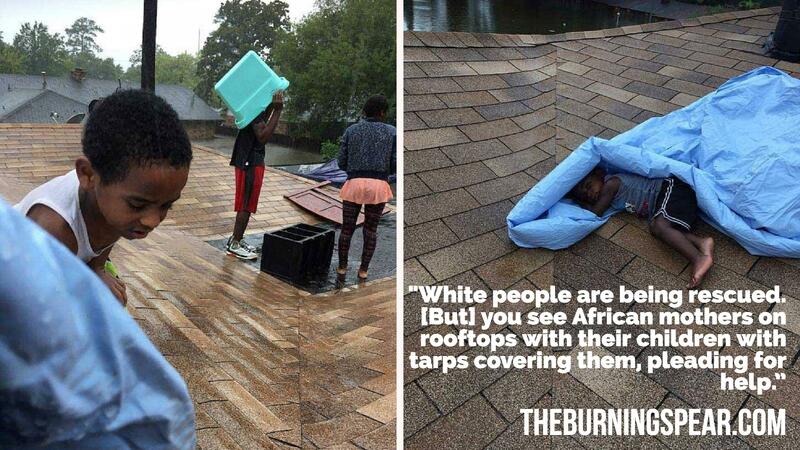 African children are forced to wait on top of their roofs for hours on end during the heavy rainfall and winds of Hurricane Harvey. HOUSTON—Hurricane Harvey made landfall upon Rockport Texas on Friday, August 25th at 11pm local time as a Category 4 hurricane. The storm, which is expected to last for a next few days, is déjà vu for African (black) people, reminding us of Hurricane Katrina which hit New Orleans 12 years ago. This familiarity which one may feel about Hurricane Katrina when looking at Hurricane Harvey is the yet another slap-in-the-face evidence that the State does not care about African people. Under the system of colonialism, what is happening now in Texas with Harvey and what happened in New Orleans with Katrina is a genocide that is committed against African people at the hands of the State on a daily basis. Colonialism leaves African people to the mercy of the environment since our resources are stolen daily for the benefit of the white oppressor nation. And so when we look at Hurricane Harvey, we must look at it from this understanding, from this African Internationalist point of view and recognize that no matter where we are, African people have a relationship with the colonial State that deems us as powerless and oppressed. Similar to New Orleans, the State did not adequately inform the residents of Texas on the level danger that they are facing with the hurricane. Residents were told to stay put in their homes as that would be the safest place to be. On Sunday when the flood waters were rapidly rising, it became apparent to some residents in certain parts of Texas that in order to secure their safety, they would have to evacuate. Chiwoniso Luzolo and her husband Hashim Bissalam, residents of Cypress, Texas and members of the International People’s Democratic Uhuru Movement realized that the flood waters were rising extremely rapidly around their home––which is on 12-foot stilts––to about eight feet. After calling the States’ emergency lines and first responders only to be met with ongoing busy lines, they decided to take it to social media and enlist the help of the people. That is when they organized for Nyabinghi Fungisai to go live on Facebook on their behalf to call on regular people with boats to rescue the couple or loan the boat to Nyabinghi to do so. Almost 700 concerned viewers tuned into Nyabinghi’s live stream, asking on how they can help, uniting to call the first responders and demand help for Chiwoniso and her husband. The State, was still no where to be found. Hundreds of people were calling the State to help rescue the couple but lines were increasingly busy and when a caller finally got in touch with the State, they were told that the couple’s situation wasn’t an emergency until water started entering their home. It is appalling to think that eight feet of water surrounding your home during a Hurricane is not an emergency in the eyes of the State. But this is the reality for African people living under colonialism, it it up to the oppressor to determine what is an emergency. This is a clear example that the State and its representatives do not care about African people, our conditions and the danger that we face during dangerous natural occurrences. Nor do they have the decency to be respectful to people who are in need. The U.S. Army Corps made the decision to release the two reservoirs, the Addicks and Baker at 2 am but ended up releasing the damns two hours early around midnight. Both reservoirs were designed to protect downtown Houston and the interests that the State and the oppressor white nation has there. But what releasing the damns did was cause additional street flooding into other areas of Texas, causing the water levels to rise and spill over into people’s homes. This was the case for Chiwoniso who woke up Monday morning to an additional 2 feet of water. Her situation, as well as the conditions of many other African people, were becoming much direr by the second. This is when Chiwoniso took to Facebook via a live broadcast at 10:27 am on Monday to call on the masses for help. In her video, which showed heavy rainfall and heavy flooding, Chiwoniso explained to the viewers that they were now facing over 12 feet of gasoline filled-flood waters, falling trees and debris. Over 2000 people tuned in, growing increasingly concerned for her safety. Chiwoniso, also made a sharp criticism of the State for its in-action around African people’s safety. On top of that, it is easy to say that people should just evacuate, but it must be understood that African people cannot simply pick up and leave when we do not have anywhere to go to or any resources to take us there. We do not have multiple homes, vacation homes and lake houses to vacate to. For many the only option is to stay put and ride out the storm. Chiwoniso also spoke on the lies that the media is telling to make it seem that the first responders are responding. She was adamant that the white ruling class media is controlling the narrative. “Houston is not under water; Africans are under water. White people are being rescued. They are on rafts, on boats. [But] you see African mothers on rooftops with their children with tarps covering them, pleading for help and they have been there since yesterday,” says Chiwoniso. I was able to speak with Chiwoniso in an exclusive interview for The Burning Spear newspaper where I learned that as a result of the organized efforts on social media, Chiwoniso and her husband were rescued on Monday afternoon at around 4pm EST and are now staying temporarily in a hotel. Immediately following her live video, the wife of a coast guardsman named Nicole called Chiwoniso to let her that her know that her husband was in the coast guard, and that she could provide her with a special number which is only provided to the families of members of the coast guard. Nicole informed Chiwoniso on just what to say to receive this help. After calling they––along with their two dogs, two goats, and ferrets––were rescued within a couple hours and brought to a grocery store about three miles away. They are now located in a hotel, but are faced with even more contradictions such as a lack of food, water and price gouging. Although Chiwoniso and Hashim were rescued, this is far from over and there are plenty Africans still in danger. A simple scroll down one’s social media timeline would show the outcry of African people, African mothers and African women who aren’t able to get any response from the State and as a result has had to turn to social media to plea for regular civilians to help them. Why is this the case when the Unite States government has an entire army and coastguard and police force who are specifically trained for emergency situations––supposedly? This is so because this is what happens under the system of colonialism where African people have no economic or political power, are not self-determining and are at the mercy of our oppressors. The oppressor has the power to decide our fate, when to help us or when to leave us for dead. We saw this reality clear as day 12 years ago during Hurricane Katrina. And we are seeing it again right now during Hurricane Harvey. One thing is clear, however, African people must come into revolutionary organization, because the oppressive colonial State will never begin to care about us. To donate to help Chiwoniso, Hashim and other African families in need, visit developmentforafrica.org and support their Black Ankh program.